BC’s Morgan Butterbredt prepares to header the ball on Nov. 9 against Glendale College. 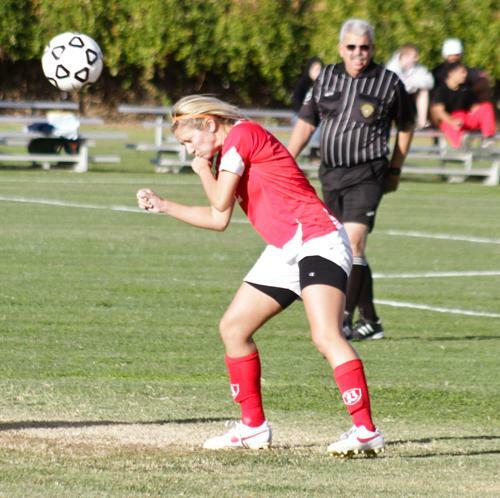 In just her freshman year, Morgan Butterbredt made an impact with the Bakersfield College women’s soccer team. Butterbredt has had two games this year in which she scored three or more goals in a single game. She has been playing soccer since she was 8 years old. She played with the American Youth Soccer Organization for two years and was also coached by her dad in club soccer, in which she was team captain in all of the six years she played under him. In the spring of 2011, she was nominated for Peak award, which is the award for the best female athlete. She said that she was very delighted with being nominated, despite the fact that she didn’t win, she really enjoyed the event. Butterbredt graduated from Independence High School in 2012. During her sophomore year she led Kern County with 36 goals and the Falcons went unbeaten in league, posting a 9-0 record. In that season, she also was Independence’s most outstanding player. On Oct. 12, in a home game against L.A. Valley College, the Renegades were in the midst of a four-game losing streak. That is until Butterbredt helped lift her team to a 6-0 victory, in which she got the hat-trick, when she scored three goals. “It felt great, I am so extremely happy,” she said. A week later, in an Oct. 19 home game against West L.A. College, Butterbredt scored a season high four goals, and her team eased their way to a 10-0 victory in that game. During that stretch, her team was on a three-game winning streak. They were outscoring their opponents 18-0, and she was responsible for seven of the 18 goals. When asked about Scott Dameron, who is the coach at Bakersfield College, she said that he is a great help and said that he was one of the main reasons she played soccer this year for the Renegades. “He is a great help,” she said. “He is a great person, he’s actually one of the main reasons that I’m playing because I wasn’t going to play. “At the end of my senior year he talked to me, he’s just a good person and he cares about more than the game. He’s like a teacher, a coach and a friend all in one. He’s just a great guy, we are honestly super close,” she said on her team. Butterbredt said her parents have made the biggest impact in her life, and that she admires them more than anything else.